Nails and beyond: Purple? You jest! Not perhaps as tricky as the Lime. I love all lilacs so I love this despite its lack of compliance. It IS shiny. I added some Flormar to most nails because I spotted a GORGEOUS Jessica polish, the spirit of which I hoped to capture in some small part. It's Jessica Born 2 Pansy. Sadly I'm on a no-buy. But when I finally emerge!!!! I have plenty lilacs but there's always a place in my stash for more. Suggestions for quick-dry polishes that aren't PITAs to apply, please. gorgeous color! 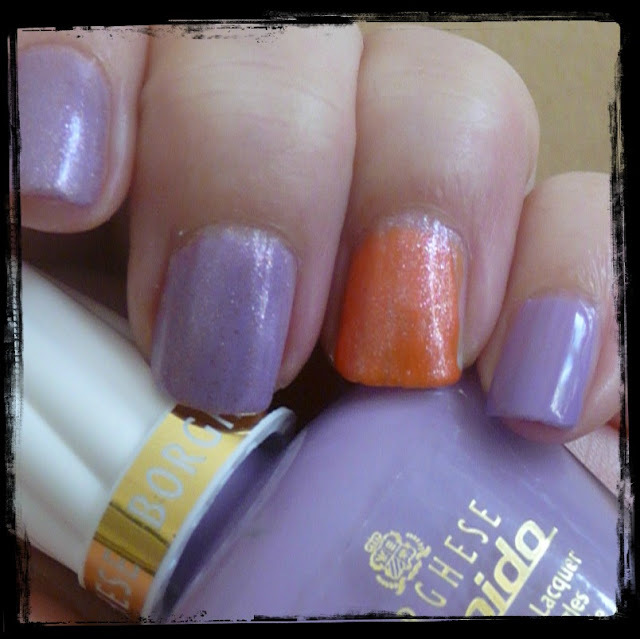 Purple and orange are an unexpected but pretty combo! As for quick-dry polishes I recommend Sally Hansen Quik-dri in the triangle bottle. Thay are usually 1-coaters and they have a wide brush! doesn't get much better right? Dammit, I saw some of those recently in the same shop and didn't get them! Arggghhh! Nice lilac colour. The orange is also pretty.